More and more businesses are getting their operations performed by remotely based team members. There are certainly advantages in getting work done through remote teams. Businesses are able to hire talented workers from different geographical locations. Businesses need not arrange for any visa and perform other legal formalities for enabling these remote workers to come and stay at the locations where businesses are operating from. This saves businesses a lot of money and effort. These workers can flexibly work from their respective locations. They can maintain a firm balance between professional and personal aspects of their life. They can work more productively. Moreover, businesses need not invest money in creating infrastructure and extending travel, boarding, lodging and other facilities to their employees. If there are benefits for businesses getting their work done through remote teams, there are challenges too. It becomes difficult for a business to track the progress of its remote members over their assigned tasks. It might not be easy Getting Things Done. It may find it difficult to keep them motivated. If a business is unable to communicate with such members in a proper manner, they may feel neglected or isolated. This can in turn affect their productivity. These remotely based team members may speak different languages, belong to different cultural backgrounds and work in different time zones. So it becomes difficult for a business to keep them on the same page over business matters. To get rid of such concerns and for enabling improved communication and collaboration between a business and its globally dispersed team members, online collaboration software can be quite beneficial. By using these tools, a business can communicate fast and transparently with its remote members. So members can conveniently raise various issues, concerns and can discuss these collaboratively. This leads to their fast redressal. This, in turn, boosts members’ productivity. Some of the techniques used by these tools are listed by productivity guru in his best-selling book - Getting Things Done. As there are so many online collaboration software available for enhanced business communication and collaboration, choosing the right ones becomes difficult. To save time and effort in finding the best collaboration aids, we have come up with a list of top enterprising tools. So businesses can review these. After getting assured about their usefulness, can employ these for smoothly communicating with their remotely located team members. These tools also help businesses in better organizing their tasks and projects. This leading project management tool enables effective management in projects by holding schedules, files, tasks and other related project information at a single centralized location. Team members remain well informed of any new activities happening in projects. Access to members to projects can be controlled. This solution offers a variety of integrations with various third party tools. This online collaboration software enables systematic and scheduled execution of projects. Team members based in remote locations can communicate fast and accurately with this tool. Their productivity at work gets drastically improved. They can readily connect with their projects even on the go through their mobile. Events can be conducted in a timely manner. Progress made at projects can be accurately gauged through Gantt charts. This collaboration tool improves organization at work, projects and this can be achieved easily and speedily. Communication and collaboration among group members become smoother. They are adequately updated about activities happening in real time. Email traffic gets eliminated. Tasks can be systematically executed. Activities in a project can be managed in a flexible manner and tracked with precision. This tool employs cards for documentation of important information. ActiveCollab is an excellent project management tool that combines task management, team collaboration, and billing into one powerful app. It enables your team to keep track of multiple projects ant any real time, maintain communication flow and collaborate with ease. With ActiveCollab your team members can upload and share documents and files, comment directly to the task and have insight into all the deadlines and responsibilities across multiple projects. Also, you don't have to keep your clients on the sidelines anymore. You can involve them in the project and let them have a clear overview of who is doing what at real time. Finally, if there is some sensitive data you want to hide, you can limit your client's access, determine exactly what they can see and share what is important. With this mind mapping tool, team members can quickly share their maps with each other for brainstorming. Team members can collaborate in real time. One can share his thoughts and ideas with his friends, colleagues and others. Professionals can use this solution to promote and express their work to anyone from any location and at any given time. Any changes made to the mind map can be easily reverted to if required. Tasks can be properly assigned to team members and their progress can be tracked. This enhances the productivity of team members. Files and documents can be included in the brainstorming process. There is handful of brain storming and mind mapping software like MindMeister listed here. This project management and collaboration tool help team members to work together without using emails. The efficiency of the team gets boosted as members’ conversations, files and tasks are put together. This helps members to achieve more at work with least effort. The enhanced organization can be achieved in projects and teams. Tasks can be effectively managed. Communication among team members gets significantly improved and they can work in a flexible manner. Milestones and goals associated with projects can be better visualized and achieved with this aid. This simple and collaborative project management tool enables proper management and organized execution of software development projects. Team members are able to collaborate with each other over software development related issues. They are able to know what they have achieved at work. They can track various upcoming milestones. They can prioritize their tasks through stories. Stories can be organized into epics to provide the whole team the big picture roadmap of a project. Mockups can be reviewed and feedback can be conveniently arranged over project matters. A great tool for teams involved in coding and software development. This enterprising project management system facilitates collaboration over content, so projects can be better managed. Files are securely located at a single place in an organized manner. Files can be efficiently shared, synced and managed. All team members get the same version of a file, so confusion at work can be avoided. Secure workspaces can be created for working with external partners. Access of individuals to workspaces can be controlled by setting permissions for them. Businesses can precisely and conveniently track and assess time incurred over their projects, tasks and clients through this online time tracking application. It grants them the ability to tag each and every time entry. A business can bill accurately considering the exact number of hours spent on various tasks. Businesses can set plans for productive utilization of their time in a day. Time entries can be accurately plotted and subjected to critical analysis through bar and pie charts. Time-related data is rendered safe and intact and can be readily accessed from any location in the world through internet. By using this application, projects and contacts can be managed in an organized manner. So companies can get their things done rapidly and efficiently. This solution can be accessed from any location using various devices. This tool integrates companies, calendar, people, tasks, events, and projects, so team members can work together for getting things done. It enables a company to grant access to external workers in its projects. Tasks can be assigned to them and they can communicate with other team members. Company’s data remains protected. Files can be accessed with ease from Google Drive. different locations, departments and business apps. Information, files, and documents can be conveniently shared across teams. Discussions about project deadlines can be arranged. Feedback can also be gathered. Projects get better organized. The need to conduct meetings over work gets significantly reduced. Work productivity gets enhanced. With this tool, designers can conveniently share designs with their remotely based clients and team members and get annotated feedback over designs. Feedback can be arranged with ease through point and click. Any number of collaborators can be added to a design project. Various versions of an image are saved for reference. This makes it convenient to review various revisions that an image undergoes. Designs get rapidly transformed into interactive prototypes through this design prototyping tool. Designs can be presented and collaborated upon in real time. Clients and stakeholders can readily provide feedback over designs through comments. Feedback gets automatically translated into to-do lists, so they can be implemented accordingly. Everyone in the design team remains adequately updated about progress made over designs. Previous versions of a design along with its comments get saved, so these can be reverted to if needed. This enables stakeholders to study and review a design’s evolution by referring to its previous versions. We have also made a huge list of prototyping tools similar to InVision. This online whiteboard enables creative teams to visually organize ideas and collaborate on designs. Ideas can be organized through sticky notes, links, documents and images. Brainstorming and discussions can be done over designs. Team members can provide best of ideas at any given time and from any location. All changes in a design are tracked, so every team member can attain a greater understanding of changes made in the design. They all are at same page over a design. Data transfer is made secure and private through SSL. By holding together designs, projects, iterations and collaborators at one single place, this online visual collaboration tool drastically improves organization and management over design projects. Feedback over designs can be visually obtained. Comments can be precisely put over the creative content which enables the reviewer to develop a better understanding of it. Design revisions can be managed with ease. All iterations and comments made over a design are kept good track of. This tool improves collaboration among team members through flexible online workspaces. Ideas can be shared transparently within the team. So ideas evolve further and get translated into finished products. Contextual feedback helps to reduce misunderstanding among team members. Feedback can be provided through comments. Information gets easily distributed within the single workspace. Online boards hold the ideas which team members can access from their device from any remote location. Files from web or computer can be added to the board. Work gets quickly shared through email or URL. Work gets automatically saved as team members perform their work. Every team member views the most updated version of the work all the time. This enterprising tool enables remotely dispersed team members to collaborate and brainstorm on ideas in real time through shared whiteboard. Their thoughts and strategies get adequately documented. The board’s URL can be shared easily with team members. They can add notes to the board for improved clarity over their thoughts. Images or files can be uploaded by dragging and dropping them. The entire history of the thought process gets adequately saved. So it can be readily reviewed by rewinding it. This online collaboration tool is perfectly suited for online tutoring. Online whiteboard, text chat, real-time audio, document uploading, holding unlimited sessions are some of the enterprising features of this tool. Apart from online training, this solution can be employed for revising artwork, brainstorming, sales demos and for conducting tests, interviews. This online project management software improves team collaboration and helps the team to be more productive. It enables businesses to bring great products to the market at a fast pace. Tasks, teams, and projects can be better managed. This solution supports Google Drive and Dropbox integration. By using this aid, engineering teams, web designers, educational institutions, digital agencies, financial firms and others are able to work in an organized and efficient manner. This visual collaboration tool facilitates real-time communication, the collaboration between clients and team. The design review cycle becomes smoother and it can be completed fast leading to speedier approval of designs. Graphic annotations enable clear feedback on images. Design files can be visually discussed upon and changes made in the designs can be effectively tracked. Prototype and iteration can be used for design development. An idea gets evolved into a product in less time. Data is rendered secure through encryption. Weekplan is an online calendar planner based on Stephen Covey’s four quadrant model. With Weekplan, we encourage you to think of goals you want to achieve during the week. The daily planner app not just allows you to set recurring tasks but helps you to prioritize among them. Through daily reminders and notifications, more than 300,000 of our users stay productive managing their time effectively. You can mark tasks as important or urgent apart from updating your priority list as and when you feel like. Capable of being integrated with Google calendar, WeekPlan helps you keep a tab on the time you spent the most on a particular task. This software helps to manage your creative work better and share your work with your team of designers. It is excellent collaborative software through which you can start a meeting with your team just from anywhere using desktop or mobile. It is the easiest way to mark up and discuss images online. You have to simply drag or drop images from your desktop or mobile. It is a flexible project management web application that supports a number of projects at the same time. The teamwork has been made a lot easier using this collaborative software through which you can communicate and start a meeting with anybody. It is an application platform through which you can build, run and deploy any business apps rapidly. It is a simple and effective collaboration platform used by the companies to get their projects done using this software. It is an unlimited private code repository, free for five users and an effective collaboration platform. It helps you to manage, deliver and maintain websites, applications, and business projects. Tools and activity are to be found in a single workspace. It collaboration tool for business of all sizes. The spreadsheet is simple to understand and can be effectively used for simple to complex projects. It incorporates powerful tools and an effective interface that makes the software development a lot easier. It can be used for open source and private projects. It helps in task management, file sharing, and communication without the need of e-mails. The team members can build up the project staying connected through this software. Working with a group have become a lot easier using this collaboration software where you can effectively communicate with work groups and get work done. This collaboration software has made teamwork a lot more effective using hash tag where you can communicate clearly and build up a project in real time. It is an organizational tool that helps you manage projects requiring a large team. You can communicate effectively and even keep a journal. It is collaboration software that helps you to manage large projects involving an extended team who can work together in real time. You can gather information, save what is important and then share it with your team. It helps you to organize information into meaningful knowledge. It is a set of simple and intuitive collaborative tools that helps you in strategic planning and execution of projects effectively. It is a personal team website free for up to twelve members that helps you to manage and organize your team in an efficient way. It is a web-based task management tool that helps you to complete projects as a team. It is customizable and can manage the entire work process of your organization. It is instant collaboration software that helps in the online meeting, video conferencing and managing your projects in an effective way. It is a real-time work space where you can collaborate as a team to get the work done. It is very effective from simple to complex projects. It helps you to store information in a cloud and access it from anywhere in real time irrespective of your internet connection. It is a simple and effective way to chat individually or in groups and your messages would be stored in the cloud for you to access it from anywhere. It is a fully customizable API for you to get integrated with your work environment and you can manage your projects more efficiently. This is collaboration software that made team work easier. the tools are very helpful for working in a group without being physically proximate. This software helps you to work with a team wherever you are and it helps you to complete complex projects using the interface. You can work with any number of users getting your projects updated and fid it easy to work n this collaboration platform. It’s a mobile application that lets you take stock of the situation by discussing and presenting ideas on a whiteboard. It is collaboration software that helps you to manage your tasks as a part of the team and get things done with team work. You can chat with your team members in real time and get the projects going with the help of this collaboration software. You can share and collaborate with clients use this portal and it makes sure that no data is lost even if you delete it. It effective manages the teamwork where a team that is situated around the globe and it produces the result at the click of the button. It is a web-based collaborative IDE that helps you to manage projects with team members who work around the globe ad get you desired result. You can maintain a transparency between your team and the customers with the help of this collaboration tool and manage your projects better. You a brainstorm, organize and prioritize your work with the help of this application and get a project completed within stipulated time. It uniquely manages the file sharing technology with collaboration software that manages documents efficiently. It is a flexible collaboration platform that made a team work a lot more effective and get the project done in an efficient way. It is a web application that helps the caring minded people to take care of the concerns they have for the others. You can keep a tack of your appointments by this scheduling application and make sure you never miss an important business meeting. It is a streamlined festival management system by which you can keep track of the submissions and issue reports at your ease. Britix24 is a company internal social network with many collaboration tools. 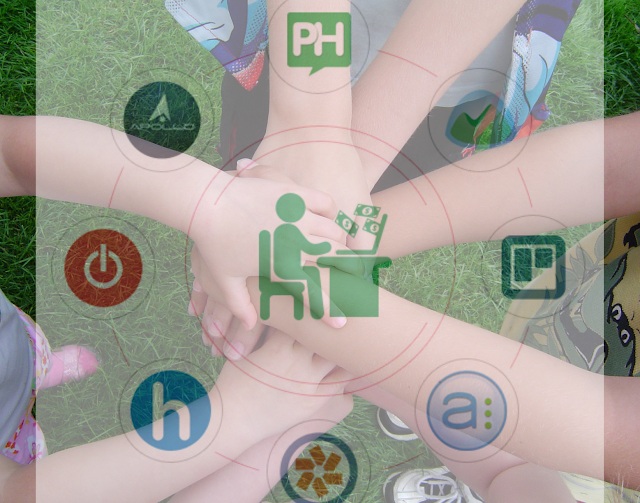 Which collaboration tool are you using? Is it not listed here? Don't forget to share with us in comments. ProjectManager.com is an online project management platform. The software contains many robust project tools such as a real-time dashboard, Gantt charts, task management, workload management, custom reporting, timesheets, and more. This time, tracking tool helps businesses deeply understand the productivity of their employees. It helps them know where and how exactly work hours are spent during the workday by also giving data on web and app usage. By having all these information, it is much easier to evaluate and improve productivity. No other time tracking tool gives a more robust analytics for the workday. It also has some handy features like a popup that appears when you get distracted from your task at hand. That should keep employees focused. This tool enables designers to easily share designs with their clients. Designs can be visualized from the web browser. It has got the retina ready capability, so retina images look great on retina and non-retina screens. Designers are able to browse their Flatsies on the go through its mobile feature. Designers can upload all their designs real fast through batch uploads. Updated on October 2017: Added more tools link. Updated On March 2017: Added more tools link.